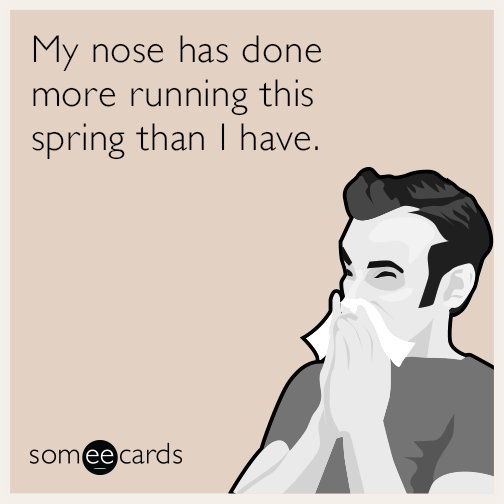 Runs with Sole: Running with allergies is a pain in the nose! Allergens are lowest in the morning, so try to plan your run in the early morning hours (before 9:00 AM). This is also something to try when the weather starts warming up in the summer. It will only get warmer as the day goes on. Pay attention to the weather. Pollen is less abundant in cooler, wetter weather, making it a little easier to breathe than in warm, dry weather. This is helpful when we have the marine layer hanging around in the morning. But also keep in mind when we have Santa Ana winds, allergens are kicked up, making it very hard to breathe, let alone run. Plan your outdoor workouts accordingly. Run in more open areas and try to avoid routes with lots of trees or grassy fields. The lesser amounts of allergens from trees and grass will help you breathe better. While I love my trails, I have to opt for more road running when my allergies are bad. Thankfully, the ocean breeze along the coast helps my breathing. If you’re prone to itchy eyes, wear protective sunglasses to protect your eyes from irritants. Breathe through your nose. As with any respiratory problem, like asthma or allergies, it's easier to breathe through your nose than your mouth. The nasal passages help filter out the air as you inhale. If this isn’t an option for you, try cupping your mouth with your hand to decrease the amount of allergens you breathe in. Try to slow your pace. It will be easier for you to breathe. Try to focus on your running form as well: keep your shoulders loose, your chest open, and your posture tall. This will create more space in your chest, helping you breathe a little easier. If you take a decongestant, be sure to drink enough water. By definition, decongestants dry you out and this can contribute to dehydration. If you take an allergy medication, be sure you are alert enough to be running outside alone. Perhaps you should avoid listening to music to be sure you're safe on your run. Rinse your nasal passages with a neti-pot or saline spray to remove allergens. You may want to keep your windows closed during Santa Ana times as all that stuff in the air will get in your house. And be sure to change your air filters regularly. Be sure to shower after your run to remove the allergens from your hair and skin. Even on non-running days, showering at night will remove allergens, decreasing the chances of an allergy attack while you sleep. You should also take off your shoes as soon as you get home so you don't track allergens throughout your house. On really high pollen days, you may just want to take it indoors. That way you won't have to battle the elements. How do you deal with allergies? What works best for you?